Chocolate Banana Marble Cake / Marbled Banana Bread is a healthy, moist, eggless and a delicious dessert. Yummy banana bread with swirls of chocolate – A perfect tea time serve. Hello everyone. I personally like loaf cakes / tea time cakes a lot. They are easy to make, don’t require icing (most of the times) and can be eaten hassle -free! Actually loaf cakes are ideal for breakfast as well as tea time. Especially if it’s a healthy loaf cake, you can eat it as a quick breakfast. Getting late for the office or simply don’t want to make breakfast, not to worry! Just grab two loafs of a healthy loaf cake/ tea time cake and a hot cup of coffee; you are sorted with your breakfast. And if we are talking about healthy loaf cakes, we CANNOT FORGET banana cake. Yes! Banana loaf cake is one of the healthiest loaf cake you can ever have. Firstly banana is an amazing fruit; full of potassium and manganese. Yeah! Quite a healthy one. Want to make it healthier? Add a handful of dry fruits- Almonds, cashews, walnuts etc. Banana cake is one of the most loved cake around the world. Banana is an amazing ingredient for baked goodies. It is in fact a good substitute of egg. Cakes containing banana are soft and fluffy in texture. I have experimented a lot with banana cakes till now. I already have some banana cakes / banana breads recipes on the blog and I’ll share more in the coming time. Banana is such a fun ingredient to experiment with. It combines well with a lot of other ingredients like walnut, almond, cinnamon, chocolate etc. Well, today’s recipe also combines banana and chocolate – A classic combination. Today’s cake is a Healthy + Fancy Loaf Cake. Okay. May be ‘fancy’ is an exaggerated word but believe me the chocolate swirls really look good. Banana + Chocolate + Cake : Sounds good? If you answer is yes then definitely try this recipe. The base of today’s recipe is banana and the cake consists of swirls of chocolate in between. For making chocolate swirls, we will take out 1/4th of the prepared cake batter into a small bowl. We will add some cocoa powder. Mix well and our chocolate batter is ready. We will use this chocolate batter for making the swirls. So how do we get these swirls? I have used a loaf pan. You can also use a round cake mold or a square cake mold or whatever mold you have. It doesn’t matter. So, firstly we will add the base (banana) batter into the cake mold. Just a small amount of it. Make sure the batter covers the entire cake mold. Then we will drop the chocolate batter, using a teaspoon. Again add a small amount of banana batter. Drop chocolate batter again. Add the remaining banana batter. Now, with the help of a toothpick or a cake tester or a wooden skewer or even a knife, mix both the batters. But remember not to over mix the batter otherwise you won’t get the swirls. So, basically you have to run the toothpick (or whatever you are using) through the entire cake batter . We will bake the cake at 180 C / 350 F for 30-35 minutes or till a toothpick inserted into the center of the cake comes out clean. This cake is simple to make but tastes amazing. You can serve this along with tea and other snacks during tea time. You can also gift this cake to your friends and family members. 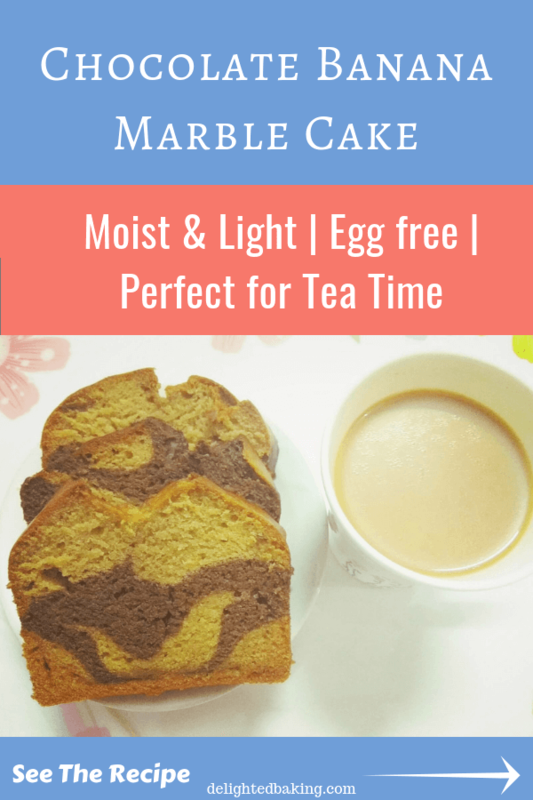 Chocolate Banana Marble Cake / Marbled Banana Bread is a healthy, moist, eggless and a delicious dessert. 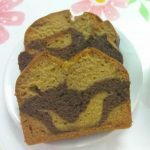 Yummy banana bread with swirls of chocolate - A perfect tea time serve. Mash the bananas either by using a fork or simply chop the bananas and puree them in a blender. Sieve flour, baking soda and baking powder. Keep this aside. In a separate bowl, add oil. Add sugar. Wisk it till the sugar melts. Add mashed bananas . Wisk it properly. Now add vanilla essence. And mix nicely. Add the dry ingredients (flour, baking soda and baking powder) to this wet mixture (oil,sugar,mashed bananas and vanilla essence). Mix till it forms a smooth batter. Pour half of the plain mixture into the cake tin. With the help of a spoon, add chocolate mixture. Cover this with the rest of the plain mixture. Now, with the help of a fork, make 1-2 swirls . Remember not to over mix. Your healthy and tasty Chocolate Banana Marble Cake / Marbled Banana Bread is ready.